Finnmark is Norway’s largest county and the northernmost part of mainland Europe, reaching a latitude of 71° 11’ 8’’N. It is the easternmost part of Norway as well as Hornoya near Vadso sits at 31° 10’ 4’’E, roughly the same longitude as Cairo in Egypt. Finnmark translates as "Land of the Sami", and Sami presence has a long history. Reindeer herding with its seasonal migrations between inland and coast is still done. Bordering Finland and Russia (and these borders were drawn as late as 1826), it is not surprising that this area, though thinly populated, had a rather mixed population. This, combined with difficult communications and a relatively undeveloped economy, made most of the rest of Norway to regard Finnmark as perhaps exotic, but definitely "fringe". Finnmark was the part of Norway that suffered most during WWII. The Germans retreated in the autumn of 1944 and used the scorched earth tactic. Almost everything was destroyed. After WWII, with the emerging Cold War, Finnmark became the only place in Northern Europe where a NATO country bordered the Soviet Union, thus becoming a strategically sensitive area. This led to buildup of military as well as civilian infrastructure, making Finnmark a modern society. At the end of the cold war Finnmark could enjoy more normal relations with their eastern neighbours. Finnmark might look far away on a map, but it is an accessible area. With an area 48,600 km2 (roughly the size of Denmark), and a population of only 70,000 people, it is not exactly crowded. On the other hand it gives lots of place for geography. In the western part, as far north as Mageroya, a string of large islands shelter the coast. East of Mageroa there are few islands and the coast face the Barents Sea. Finnmark has five large and wide fjords, unlike the myriad of narrower fjords you find along other parts of the Norwegian coast. Inland the alpine landscape stretch east and north as far as Alta. From there, highland plateaus and round or flat topped mountains dominate. The highland plateaus are a mix of bog land, moraine and felsmeer. Between the plateaus are wide valleys, some of them, like the Alta, Tana and Pasvik valley have extensive forests as well as considerable rivers flowing the length of the valleys before they reach the fjord. It would probably be grandiloquent to call any place in Finnmark a city. Only Alta has a five-figure number of inhabitants. Traditionally a town in Norway had to have royal privileges, in Finnmark such privileges were given to Hammerfest, Vardo and Vadso in the late 18th century. The list below include these and newer local centres. Alta – Nowadays the most populous settlement in Finnmark. Situated at the estuary of the Alta river, famous for its salmon, in western Finnmark. UNESCO listed rock carvings in nearby Jiebmaloukta. Hammerfest - often mistakingly labeled "worlds northernmost city" (as it's Honningsvag). Important as a fishery base, important as an oil-base as well. A LNG plant is established on nearby Melkoya. Honningsvag - On Mageroya, the settlement with a four-figure number of inhabitants closest to the North Cape. Lakselv - At the inner end of the Porsangerfjord. Karasjok - Sometimes labeled "the Sami capital". Kautokeino - Main Sami settlement in the southwestern part of the inland plateau. Vardo - A fortress was built here 800 years ago to back the Norwegian state’s territorial claims. The only Norwegian town that has a truly arctic climate. Vadso - Seat of the county administration. A history of trade with Russia as well as immigration from Finland. Kirkenes - Important harbor, iron ore from the mines in nearby Bjornevatn are shipped from this port. Sitting a few kilometres from the Russian border, important functions related to Norwegian - Russian relations are situated here. The North Cape is probably the best known place in this part of the world. Lots of people go there, so don’t expect to enjoy the view of the midnight sun there in solitude. The rock carvings in Alta show fishing scenes, and fishing have been important ever since. There are plenty of opportunities to fish both in the sea and in the numerous rivers and lakes. All fishing for salmon, trout and char requires a general fishing license, in addition you may have to buy an area specific license - this applies to the major rivers, some smaller rivers and some lakes. The rivers bordering Finland and Russia have restrictions about foreigners fishing. Fishing in the sea after other species than salmon, trout and char is free. It is, however, illegal to bring more than 15 kilograms of fish out of the country (and one whole trophy fish). In many places at the coast it is possible to fish from land with a rod. For those who want to go fishing at sea, tourist establishments can offer everything between having simple boats and fishing gear for hire to fully equipped fishing safaris including processing of the catch. There are plenty of opportunities for trekking in an Arctic landscape, possibly, though not necessarily far away from a settlement. If you plan to trek inland in summer – do bring mosquito repellant (and mosquitohat)! Trekking by the coast is an alternative. Finnmark has some large birdcliffs. A few of them are easily accessible. Others can only be visited from the seaside or after a long trek overland. Skiing in winter. Some tourist operator offer dogsledding or snowmobile trips. There are lots of different opportunities to get to know more about this people. Kautokeino and Karasjok are by far the best places to go to. Sami Easter Festival - in Kautokeino. Winters are cold, but summers surprisingly warm in the inland parts of Finnmark. Long periods of bright weather and temperatures between 20 °C and 30 °C are possible, though average temperatures are usually just around or below 15 °C during the day in July. If it wasn’t for the mosquitoes it would be nice! On average the inland part of Finnmark is one of the driest areas in Norway with just under 400 mm of precipitation a year. The coast is more exposed to sea fog, and thus cooler and with more rain and overcast weather in summer (and fewer mosquitoes), though several consecutive bright days are not that unusual. The coast has milder winters as well (that is seldom below -20 °C). Temperatures inland are usually between -15 °C and -20 °C during the day, but can plummit below -45 °C during extreme conditions. The Nordkapp and Vardo area has an Arctic climate as the average temperature in July is below 10 °C. 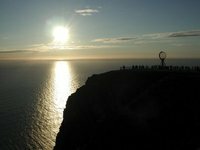 Due to the latitude Finnmark has midnight sun in summer, and a corresponding period in winter where the sun is permanently under the horizon. The whole of Finnmark has midnight sun in summer. In winter, Northern Lights (Aurora Borealis) are less predictable, as they depend on solar activity, but Finnmark is situated where they are likely to be seen. Several rather small settlements have an airfield and modern roads connects the different parts of Finnmark as well as neighbouring county Troms and neighbouring countries Finland and Russia. Buses are perhaps not very frequent, but the bus network is extensive. Alta and Kirkenes have direct flights to Oslo. Most flights from airports in Finnmark have Tromso as a final destination. Hurtigruten sails between Bergen in western Norway and Kirkenes, consequently sailing all the coast of Finnmark, docking at Hammerfest, Havoysund, Honningsvag, Kjollefjord, Mehamn, Berlevag, Batsfjord, Vardo, Vadso and Kirkenes. Kirkenes is the last stop for the northbound leg. Hurtigruten has a 3-hour stop there before it starts on the southbound leg. Motorists from the south can follow the E-6. This road runs the entire length of Norway. Travelling through Sweden, and then into Finland it is possible to drive into Finnmark by road 93, Kautokeino is 43 kilometres north of the border. Further east the Tana river forms the border between Norway and Finland. Road 92 takes you to the bridge at Karigasniemi with Kautokeino a few kilometres into Norway. The E75 to cross the Tana river at Utsjok. Road 971 runs past Lake Inari in Finland and continues to Neiden in Norway, where it joins the E-6, 40 kilometres west of Kirkenes. The towns and larger settlements will have a garage and probably a car rescue-team. Long distance buses run from Tromso to Alta. From Alta there are buses connecting all major places in Finnmark. Most places have a grocerystore, the towns will have some special retailers as well. The larger settlements usually have one or several restaurants or take-away food stores. Most towns and cities and even smaller settlements have a pub. Campinggrounds, rooms for rent, and, in the towns, hotels and hostels, are fairly easy to find. Standards on cabins and hotels do vary, but will not be different from elsewhere in Norway. This is version 14. Last edited at 12:21 on Feb 5, 12 by staaleand. 11 articles link to this page.